Learned something new just now. Hats have formal rank. The kind of thing you sort of know already, but interesting to see it codified. Top hats being at the top, of course. Then, quite a bit farther down, fedoras and derbies. And in between? 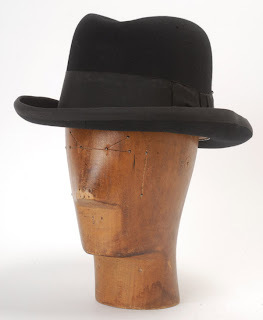 The Homburg. A rigid, curl-brimmed, crease-crowned, grosgrain banded topper, named for the German city from which it originates. Its best-known British wearers were King Edward VII and Prime Minister Anthony Eden. Here's a beautiful example from eBay seller Hogspear, which specializes in "colonial leftovers". I ordinarily don't promote individual vintage sellers but their shop is incredible, filled with such glorious empirical wreckage as sat-upon top hats, Rhodesian pith helmets, military spurs, decorations aplenty. Putting aside the historical aftermath, these people knew how to dress. How curiously stylish! It's a shame you don't see more men wearing hats - apart from those rather naff beanie jobs - they must be the lowest of the low in the hat pecking order?